Please note that we are on holidays from Saturday 6th of April 2019 until Sunday 28th inclusive. You will not be able to get in touch with us before Monday 29th. And remember to check out our Special Offers page for all our current offers. 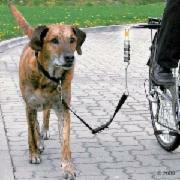 But maybe are you wondering what Dog cycling is all about. Well, I am sure you know (and maybe have one yourself) one of those dogs whose energy level is so high that you can never tired them whatever how long you walk them. And you know how much dogs love running. But of course it is absolutely impossible for us human to run fast enouh to match a dog' speed. That is why a bicycle comes handy. You can adapt your speed to your dog's one, go a bit faster. In both case, you are finally able to exercise your dog enough for her to be tired.. And we know that a tired dog is a happy (and healthy dog). So as I love cycling as much as walking, your dog can come along with me and get that extra bit of exercise she craves so much. And because safety is the most important, I am using Trixie Bike Set. 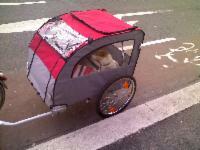 ~ Lebo's Friends, Dog Boarding is a good alternative to kennels. Your dog stay in a family environment in company of others dogs (Lebowski, Duchess and Bella) that puts him/her at ease and gives you the peace of mind of knowing that (s)he will be looked after with the same care and attention as I give to my own dogs. Happy, secure. ~ Lebo's Friends, Dog Minding/Sitting is another good alternative to kennels, offering your dog the comfort of staying in his/her own familiar environment while having three walks and visits full of TLC per day to help him/her forgetting that your are away for a few days. It gives you the peace of mind to know that your dog is comfortably taken care of in your house, giving your house a feel of you being there. Check out our Services page to know what other services we offer. You are a professional web designer and a dog (or cat) owner. You would like your animal to be walked or minded while you are at work or away for a few days. We are looking to redesign our website. Ultra professional in every way & trained in animal first aid - your dog couldn't be in safer hands. Super friendly and professional, very reliable and flexible. I completely trust her with our 4-legged babies. Yvette is a top-class dog minder and walker. She gave our elderly dog his midday walk for a few weeks, and she always sent us status updates after each walk, as well as a quick message prior to the walk. She's a very thorough, thoughtful person with a heart of gold; always respectful of the physical condition and temperament of the dog she's looking after. I would have no hesitation in using her services again in the future. Highly recommended! Would highly recommend Yvette! She was absolutely fantastic minding our dog Senna while we were away. So professional, thorough, and obviously really cares about the dog which is evident from her approach and dedication. I'd have absolutely no hesitation using her again as I know Senna would be in the best of hands! Beautiful song and video against abuse, either human animals or any other species.